The results of a four-year study, published in the journal Ecosystem Services this month, has revealed that cloud forests are responsible for filtering almost half of all surface water in tropical dam watersheds, despite covering just 4.4% of the tropical dam watersheds they inhabit globally. 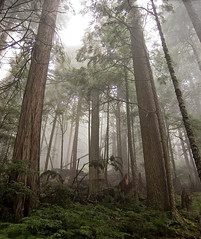 The data, which offers context to the relative productivity and importance of cloud forests to freshwater stores, energy production and biodiversity health, provides land managers and decision makers with critical information, which can be used to evaluate the high economic and ecologic value of cloud forests to healthy, sustainable societies. The study will also help to define priority areas for conservation within dam watersheds to optimize the natural benefits from cloud forests as well as the performance of dams. The full paper is available via CI here. Posted on May 3, 2013 by scalingupblog. This entry was posted in Relevant Research and tagged Cloud forest, Conservation International, dams, hydropower. Bookmark the permalink.